Come on, right? I just had to pit the book and the movie together, especially after the huge amount of hype that came out when it popped up on Netflix in August. It’s no secret that I’m a huge Jenny Han fan. I was fortunate enough to have met her in person, but few actually know that this book is the direct cause for this whole blog. I absolutely ADORED this book so of course I watched the movie on the very first day that it came out. But first things first, a little dive into the synopsis (for those of you who have absolutely no idea what this book is about). All right, who doesn’t love a cute little synopsis like that? I mean, I even got some of my male friends to watch it with me so that really says something. Below, I’m going to list out some of the things I loved and didn’t love about both the book and the movie. Pitting them together, which one would win out? As the credits were rolling and I was sitting there wondering what just happened, I must admit that I didn’t love the movie as much as I had hoped. My friends (who never read the book before) liked it well enough but there was something in me that just wasn’t satisfied. 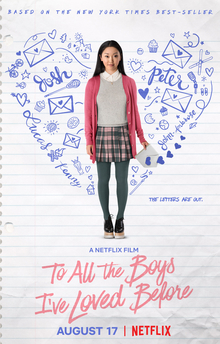 A cameo of Jenny Han was wonderful, and the chemistry between the leads Lana Condor (Lara Jean) and Noah Centineo (Peter Kavinsky) was tangible, yet my heart wished it was longer and developed a couple things more that the book did really well. I may be the odd person who can’t say they LOVED the movie, but to me, To All the Boys I’ve Loved Before as the book wins. Granted, not much could really displace the love I have for this novel in its own very special place in my heart. If you want to know just how I felt for this book, check out my review for it as well! So what do you think? If you watched the movie and read the book, which one did you think was better? Or were they tied as they both did amazing in different ways for the same story? Lovely comparison! I haven’t read all the books in the series yet, but they’re definitely on my tbr! Yes the movie was adorable! I hate to say it but I feel like the movie is a teensy bit better than the book only because I didn’t love Peter in the books (I was a John Ambrose girl) but I loved movie Peter. Noah was so good! I was really impressed. Yes! Their chemistry was so insane.